I like a band that makes me think of whiskey. That way, I know they’re not being fake. 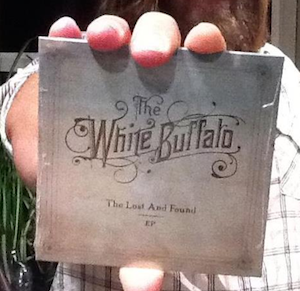 The new EP from The White Buffalo, called Lost and Found, makes me think of said whiskey. The five song EP is full of dusty guitar twang and gruff vocals. Each song is emotional, with a way-out-west feel. I especially like “The Pilot,” which has those similar guitar chords as Iggy Pop‘s “The Passenger.” Only western. It’s high-energy and cheap beer. Another good song is “Insane,” which comes across as mischievous, with a fast-paced banjo in the back. The other three songs are good, though not as upbeat. “Lost and Found” is right up there with artists like Tom Waits and (early) Neil Young. The White Buffalo is definitely a band to watch. The full-length album will be released in January, and you can be sure I’ll have my glass of whiskey ready.